On February 9, 1825, the United States House of Representatives elected John Quincy Adams to be the sixth President of the United States, after no candidate had received a majority of votes in the Electoral College. This was the first election in which the candidate who received the largest share of the popular vote did not become president. You might not expect so divisive and confusing an election in a country that had only one real political party at the time. The Federalist Party had been on the decline since the end of the War of 1812, and was in such a weak state that it had not even run a candidate against James Monroe in 1820. Monroe hoped that in the absence of a rival party, the Democratic-Republican party could unite Americans, perhaps bringing an end to political parties entirely. In furtherance of that goal, he had brought several of his rivals and critics into his cabinet. But it's hard to maintain party discipline without an opposition party to unite against, and by the time of the 1824 campaign, the Democratic-Republican party itself had begun to splinter. In this era, parties did not nominate candidates at national conventions; the Congressional caucus of each party met to nominate a candidate. When Monroe chose not to run for a third term, the Congressional Democratic-Republicans selected William H. Crawford as their nominee. Crawford had ample experience to recommend him; he had served as Ambassador to France, Secretary of War, and Secretary of the Treasury. But the Congressional nominating caucus had been sparsely attended, and there were those who thought that party leaders were forcing Crawford upon them. Crawford had also recently suffered a stroke, which left doubt about whether he would be well enough to get through an election, much less to serve as President. Various state legislatures and other groups of politicians nominated other candidates, and the nation wound up with four Democratic-Republican candidates for the Presidency. 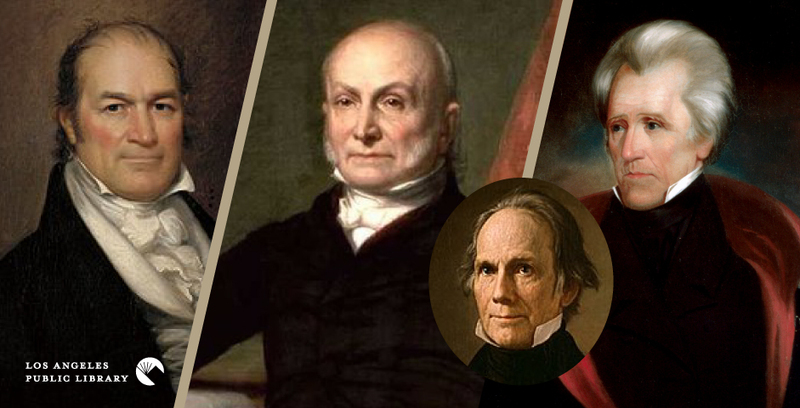 Crawford was joined in the race by Secretary of State John Quincy Adams; Senator Andrew Jackson, a hero of the War of 1812; and Speaker of the House Henry Clay, one of the nation's finest orators. Each candidate had strong support in a different region—Adams in the northeast, Jackson in the south, Crawford in the mid-Atlantic states, and Clay in the west. Jackson was the winner of the popular vote (in those states that had one; electors were still chosen by state legislators in six of the twenty-four states), with about 41% to Adams' 31%. But Jackson's 99 electoral votes fell short of the 131 needed for a majority, and so the presidential race went to the House of Representatives. Under the 12th Amendment to the Constitution, when there is no Electoral College majority, the House must choose from among the three candidates with the most electoral votes. Crawford had narrowly defeated Clay for the third position Clay could not be elected, but he was left with a great deal of influence over the House's choice. Even with Clay's support, Crawford would not have had the votes to win the election; and Clay intensely disliked Jackson. So Clay threw his support to Adams, and that was enough to give Adams the victory in the House. Rumors quickly spread that Clay had sold his support to Adams in exchange for a position in Adams' Cabinet. Jackson was furious. He had won the largest share of the popular vote and of the electoral vote, but had not won the election. And when Adams actually did make Clay his Secretary of State, Jackson and his supporters spent the next four years railing against this "corrupt bargain," generating enough outrage that Jackson defeated Adams in the 1828 presidential election. And the other candidates? Crawford declined Adams' invitation to remain Secretary of the Treasury, and returned home to Georgia, where he served as a federal judge for a decade before his death. Clay was elected to the Senate in 1831, and was nominated for President twice more, by the Republicans in 1832 and by the Whigs in 1844; while he never became President, he is considered one of the most important political figures of his era. There are biographies of most of the major players in the 1824 election. Harlow Giles Unger has written biographies of both John Quincy Adams (e-book | e-audio | print | audio) and Henry Clay (e-audio | print); H. W. Brands has written a biography of Jackson (e-book | e-audio | print | audio), and includes Clay in his portrait of the second generation of American political leaders, Heirs of the Founders (e-book | e-audio | print | audio). Mark Weston writes about the 1824 election, and the four other races in which the winner of the popular vote lost the presidency, in The Runner-Up Presidency (print). The Electoral College continues to be a controversial part of our election system; Tara Ross makes the argument for it in The Indispensable Electoral College (e-book), and James Michener makes the case against in Presidential Lottery (e-book | print). King Vidor was born. Vidor directed his first movie in 1913, and his last in 1980, landing him in the Guinness Book of World Records for the longest career as a film director. He was nominated for the Academy Award five times, and received an honorary award in 1979 for his body of work. Two of Vidor's films are available for streaming at Kanopy, covering a wide range of his career: the 1926 silent film Bardelys the Magnificent, starring John Gilbert; and the 1956 epic War and Peace, starring Audrey Hepburn and Henry Fonda. Babe Ruth was born. Ruth is considered by many to be the greatest player in Major League Baseball history. He began his baseball career as a pitcher for the Boston Red Sox. Ruth wanted to play more often than every four or five days, and gave up pitching for the outfield. He had been a very good pitcher, but with the chance to play every day, Ruth became an extraordinary hitter for the New York Yankees, and set many MLB hitting records, some of which still stand today. Jane Leavy's biography is called The Big Fella (e-book | e-audio | print | audio). Hal Blaine was born. Blaine is a drummer who worked as a Los Angeles session musician in the 1960s and 1970s. He played on more than 30,000 songs, including 40 #1 hits, and six consecutive winners of the Record of the Year Grammy Award. Blaine frequently worked with the same group of studio musicians; the documentary about their work shares their name—The Wrecking Crew (streaming | DVD). Mary Robinette Kowal was born. Kowal is a science fiction and fantasy writer whose short fiction has won two Hugo Awards. She is best known for two series of novels. The "Glamourist Histories" are fantasy novels which add magic to Austen-esque tales of romance; the series begins with Shades of Milk and Honey (e-book | e-audio | print). The "Lady Astronaut of Mars" novels are science fiction, focusing on the women of an imagined American space program of the 1950s; that series begins with The Calculating Stars (e-book | print).